Any drooling Giant Breed dog parent knows the importance of a bib! This is a handmade personalized bib for your slobbery dog. Helps keep drool and slobber away from your walls, furniture, and guests. Made with quality, carefully curated fabrics that are fashionable and striking. 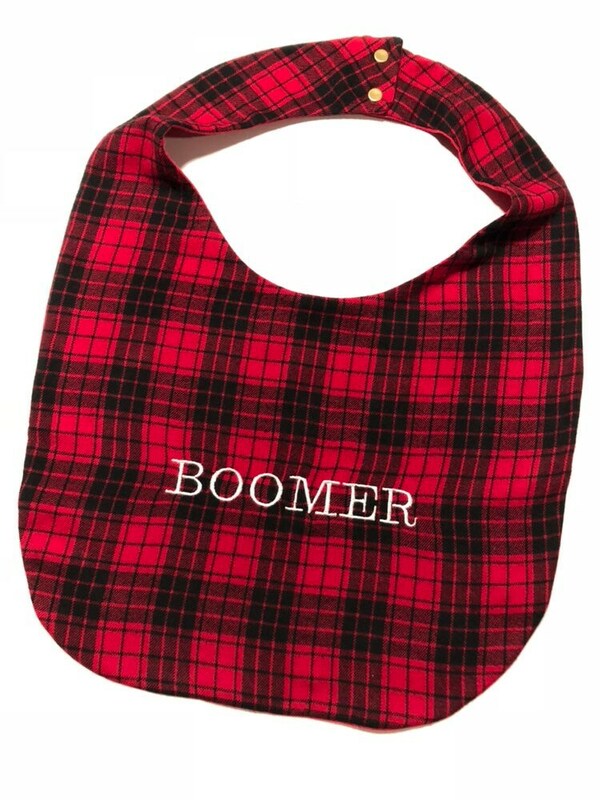 This bib is made with a red and black flannel print that is soft to the touch and functionally absorbent! Snaps at the neck ensure a secure fit. 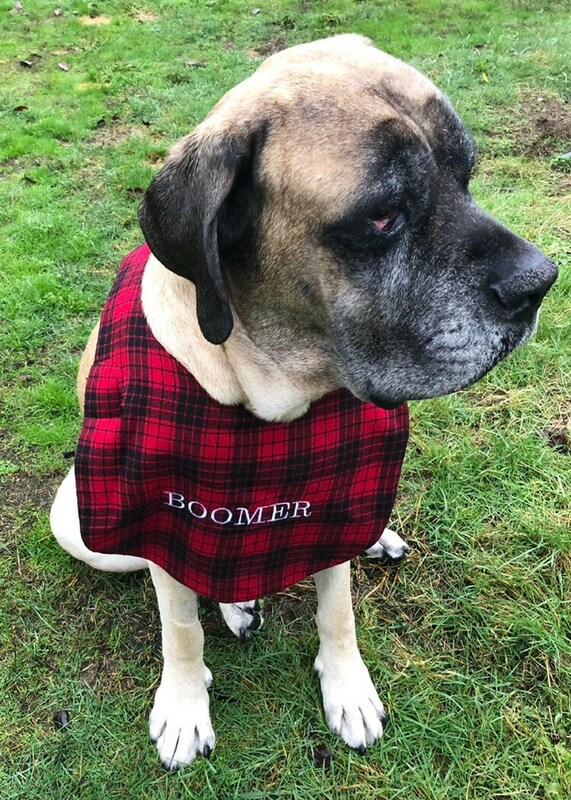 This is meant for Giant Breed dogs only, but if you require a smaller size please message us for options, or consider one of our other dog bandanas! Their name (8 characters max for best quality) will be embroidered in all caps on one side of the bib in an white thread unless you have a different preference. Bib will measure about 10.5 inches from center neck to bottom of bib, and about 13 inches from side to side. For fit, measure around the neck with a soft tape measure where bib will lay (typically near their collar.) The fit should be snug but not tight. Don't have a soft tape measure? Use a piece of string and measure that instead! Made with extra room around the neck for comfortable fit, and also will stretch a little with wear. All items are handmade, so they may vary just slightly from listed measurements, which just adds to the uniqueness of the piece! When in doubt, contact us and we are happy to help with sizing! •Items are made to order so they can take 1-2 business days to ship. •Standard USPS shipping. This estimates delivery within 2-5 business days. •Want it quicker? No problem! Just choose Priority Shipping which includes a tracking number and delivers within 2-3 business days. •Orders to Canada are shipped USPS First Class International package service and do not include a delivery estimate since it varies by area. *Please note any taxes or duties charged by your country for delivery are the responsibility of the customer. All fabrics are pre-washed and durable, so they should be just fine thrown in with your normal wash and tumbled dry (make sure they are like-colors!) but of course with handmade items hand washing and laying to dry is best to keep the integrity and color. Got any questions? Contact us and we're happy to help! We answer questions as quickly as possible.